Rosacea is a facial skin condition that causes redness, swelling, and pimples. One of the major causes of a breakout is different foods, so it is highly recommended that you know what the rosacea triggers in your diet are. The primary goal of a rosacea diet is to help keep the symptoms and flare-ups of this unsightly facial condition at bay. We’ll examine the foods that can help prevent a recurrence, as well as foods that you should avoid. This article may not be able to cure you of rosacea, but hopefully, our tips and diet tricks will be able to help keep your symptoms in check. There are a few approaches that can help you in your quest to find the proper treatment for rosacea. And, the good news is that most of the foods you should be trying to eat for a rosacea treatment diet are foods you should be trying to eat anyway. Foods that contain omega-3 fatty acids and antioxidants are recommended as the anti-inflammatory properties can help reduce breakouts and the visibility of rosacea on your skin. Certain whole grains and foods packed with fiber are also suggested as they lack added sugar which can worsen the condition. Here are a few suggested foods. Berries are highly recommended, especially blueberries, which are high in fiber and antioxidants. Vegetables like leafy greens, broccoli, green beans, and cauliflower are among the recommended veggies as they are fairly high in fiber. Fish can be a good source of omega-3 fatty acids. Salmon, in particular, is highly recommended as it has a fairly high omega-3 content. While most grains and whole grains are discouraged in a diet for rosacea, there are a few that can help due to their anti-inflammatory properties and lack of added sugars. Brown rice, quinoa, and millet are the best examples of this. When preparing a diet with rosacea in mind, it may look like a fairly daunting task, as there are a fair amount of foods on the list to be avoided. However, avoiding these foods aren’t just good suggestions on how to treat rosacea, but also a good path for a healthy diet. Processed foods and sugars are at the top of the avoidance list as they can help encourage a rosacea reaction and flare-up. You should also avoid fatty and greasy foods. The following are foods and beverages you should avoid as part of your rosacea natural treatment plan. There are two major reasons to avoid alcohol. The first is that alcohol can result in vasodilatation, which is the widening of the blood vessels in the facial area, causing redness and rosacea breakout. The second reason is that alcoholic beverages contain large amounts of sugar which can also help feed a rosacea breakout. Hot beverages like coffee, tea, hot cider, and so on, can cause your face to become flushed as they go down your throat. These fluids exchange in the major arteries and veins in your neck, which can exacerbate the symptoms of rosacea. The National Rosacea Society has reported that one in five sufferers noted that their rosacea condition could be triggered by chocolate. The reason for this could be because chocolate contains theobromine, an alkaloid that can help dilate blood vessels and cause flushing in the face. Fried foods are high in omega-6 fatty acids, which cause an inflammatory response in the body to help trigger rosacea. Processed foods tend to contain large amounts of sugar. Sugar, as we previously noted, can help worsen the inflammation of rosacea. There are many other foods that seem to have a connection with rosacea flare-ups. But, as of this writing, there are no solid theories as to why they may worsen rosacea. Dairy products and spicy foods may help increase inflammation, as well as fermented foods like sauerkraut, kimchee, and blue cheese. As to why they may increase inflammation is still debatable. While the majority of the home remedies for rosacea tend to be dietary in nature, there are a few other things that you can do that may be able to help with your rosacea treatment. Every human body is different. So, what triggers a rosacea breakout in one person may not be the same for you. Some people may be able to eat chocolate with no effects while others might get a rash on their face. Identifying your triggers is the first step in avoiding them. Skin damage can also help rosacea to occur or flare-up. The use of sunscreen can help stop UV rays from triggering your condition. Using natural moisturizers like coconut oil can help provide the skin with nutrients, as well as avoid a reaction with the rosacea. If the non-medical options and diet don’t seem to work for you, talk to a doctor. There are a few medical options like salicylic acid and antibiotics that may help you in your battle. Rosacea sufferers always question whether there is a rosacea cure or how to get rid of rosacea. Unfortunately, rosacea has no known cure. Once it begins, you are stuck with it, but you can manage it and its symptoms. Make a few changes to your diet and protect your skin. If that doesn’t work, see a doctor. You may be stuck with rosacea for the rest of your life, but that doesn’t mean you have to suffer from it. 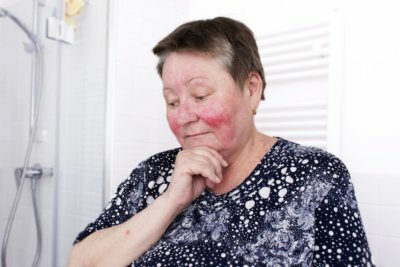 “Rosacea,” Mayo Clinic; http://www.mayoclinic.org/diseases-conditions/rosacea/home/ovc-20235169, last accessed August 2, 2017. “All About Rosacea,” National Rosacea Society; https://www.rosacea.org/patients/allaboutrosacea.php, last accessed August 2, 2017. Coleman, E., “Foods to Eat for Rosacea,” Love to Know; http://diet.lovetoknow.com/wiki/Foods_to_Eat_for_Rosacea, last accessed August 2, 2017. “Dramatically Reduce Rosacea with the Alkaline Diet,” Live Energized; https://liveenergized.com/alkaline-diet-resources/the-alkaline-diet-and-rosacea/, last accessed August 2, 2017. Metrus, L., “The Rosacea Diet: What to Eat (and Avoid) for Calm, Happy Skin,” Byrdie; http://www.byrdie.co.uk/rosacea-diet, last accessed August 2, 2017. “Foods to Eat for Rosacea,” My Sensitive Skin Care, My Sensitive Skin; http://www.mysensitiveskincare.com/foods-to-eat-for-rosacea.html#axzz4oOJ4FrIS, last accessed August 2, 2017. Lohrey, J., “Salicylic Acid for Rosacea,” Livestrong, September 26, 2015, http://www.livestrong.com/article/283806-salicylic-acid-for-rosacea/, last accessed August 2, 2017. “7 Foods That Can Trigger Rosacea,” Reader’s Digest, http://www.rd.com/health/conditions/rosacea-foods/, last accessed August 2, 2017.